My friend Tiffany C. gave me this wonderful box of chocolate from around the world! Inside was a detailed list of each chocolate tablet’s origin, cacao percentage, and flavor profile. Of course, I had to take a picture of the tablets themselves. My favorite was Vietnam at 73% cacao, beating out Uganda at 80%. I found Uganda to taste a bit sour in its aftertaste. Peru and Costa Rica were both 64% cacao, but Costa Rica tasted a LOT sweeter. 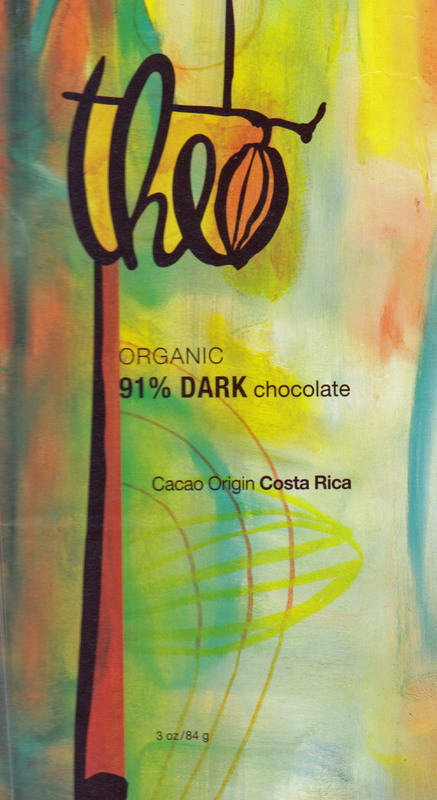 Costa Rica also had a milk chocolate tablet at 38% cacao, and it was pretty good…for milk chocolate. Their dark tablet was much better. This was my first time ever tasting chocolate from Vanuatu, and it was quite good! The tablet was milk chocolate with 44% cacao, so it was quite deep in flavor. Java is an island of Indonesia, but I don’t have any idea where Arriba is from. It is a town in Colorado, but I don’t think that is where this tablet is from. We tried the Costa Rica bar next. OK, this bar is my favorite! Of all the bars this week, this one was the deepest, the richest, the most chocolatey of them all, and unlike the Tanzania bar, there was no astringent aftertaste. In fact, there was not much single origin note to this bar at all, but it was still my favorite. It was just the epitome of a good dark chocolate. 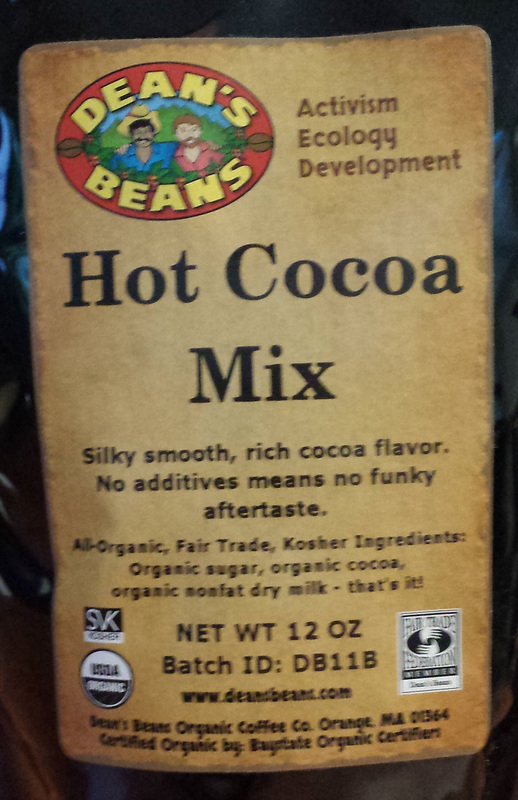 The hot cocoa mix from my cacao tree came in today! I was really excited to get this package. It contained four of the pouches you see above, which is a total of three pounds of hot cocoa mix. The cocao came from my tree on a farm in Costa Rica, and the nibs were processed in Massachusetts with pure organic ingredients. I took one pouch to work, where I mixed a couple of tablespoons in with a cup of coffee. The sugar, cocoa and milk turned it into the perfect latte! It was delicious! I plan to make all of my coffee this way for many months to come. In the fall of 2013, my niece April had been to Costa Rica right before joining her family in the Outer Banks of North Carolina. She brought some chocolates back with her for us to try! These were great! 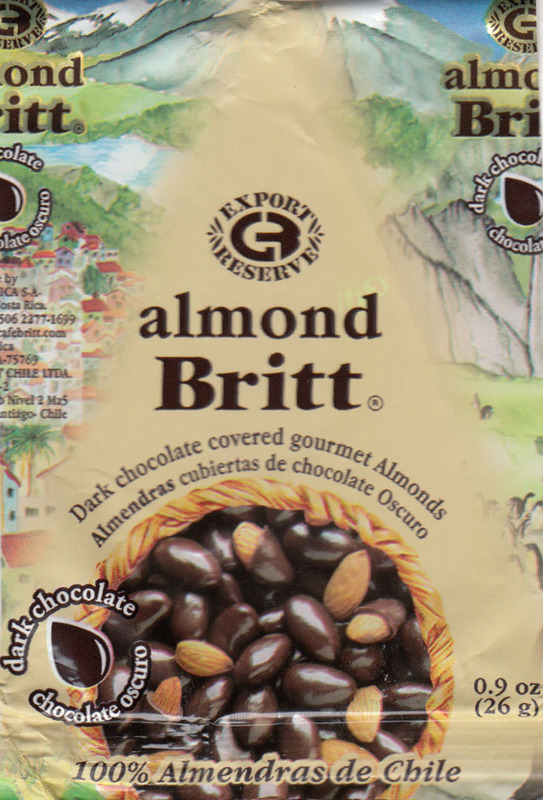 I love chocolate covered almonds, and these had delicious dark chocolate and perfectly roasted almonds. I think I ate them so quickly that my sister didn’t even have a chance to try one. I felt bad about that.. a little. 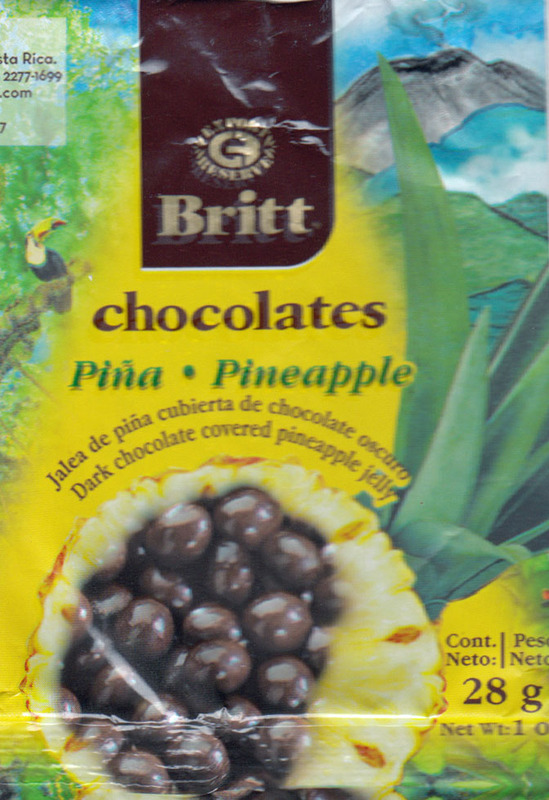 April also brought these dark chocolate covered pineapple bits, and I was not a fan. The chocolate was good, but the pineapple was too tart and too chewy for my tastes. I think freeze-dried pineapple would have worked better. My friend and co-worker Steve M. brought this bar to a chocolate eating meeting in May 2011. I liked this bar. The chocolate was very good and a very deep flavor. It wasn’t fruity or nutty or bright, like other single origin chocolates I have tasted. It was just rich. Interestingly, this chocolate brand is the same as Cachet, a brand whose single-origin bars I have tended to dislike. You can read about the connection of these two brands here. For some reason, no mention is made of this connection at the Hägeland site (warning! Lots of Flash use and ambient music!). Michele brought some more Soma chocolate to work. 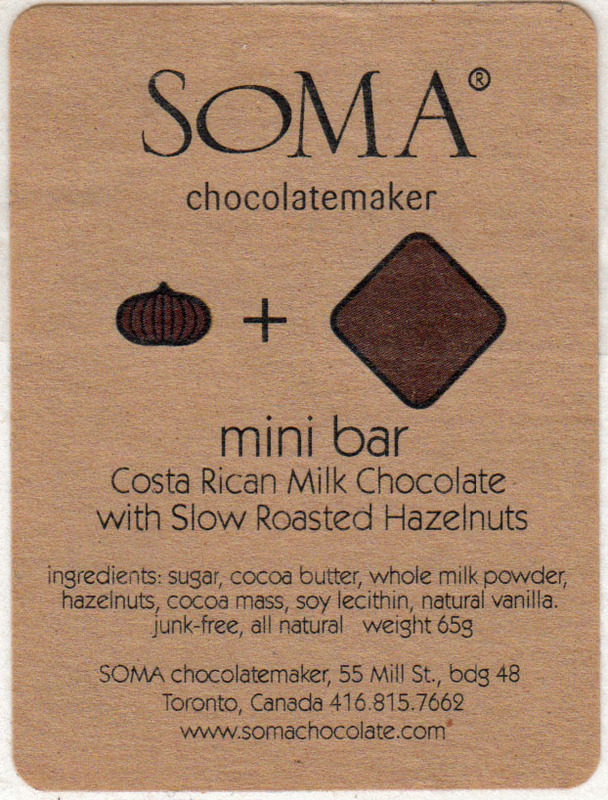 Unlike the other Soma chocolate (like their great orange peel bar), I didn’t like this one. It was very weakly chocolate flavored, and the hazelnuts didn’t help. I usually like nuts in my chocolate, but here they just made the chocolate taste even more diluted. I guess this is proof that good ingredients can make a bad bar. Continuing our way through the chocolate that Troy brought back from Seattle, my chocolate meeting eaters reached this bar. This was an interesting bar. At 91% cacao, it’s a bit higher than my sweet spot, which ends at 85%. I mean, this bar is 91% chocolate and just 9% sugar and a touch of vanilla. That’s a lot of chocolate. When I tasted it, it starts off sweet, but it quickly gained a sour note, and that’s what lingered in my mouth. I tried another bite and confirmed it. I liked this bar, but I didn’t love it, and it was one of the few bars that did not get eaten up completely by the five or six people at my chocolate eating meeting. BTW, I really loved this label. I know I probably am not seeing all the color in it, but I love the look of swirling abstract water color. You don’t see many labels like this one, especially from a U.S. chocolate maker.